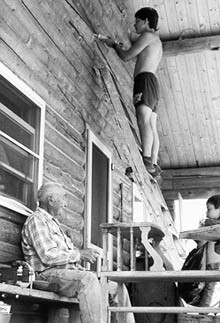 "On the Maker," part of an interview I conducted with Tom at his home in Wyola, Montana on August 28, 1974. "On Burnt Face and the Medicine Wheel," a segment from Tom's telling of the Burnt Face story. Told at his cabin east of Wyola on June 27, 1993. We pick-up the story after the young boy had badly burnt and scarred himself, and was ostracized from his people. He has decided to fast in the mountains and seek a vision. The story of Burnt Face was one of Tom's favorites. 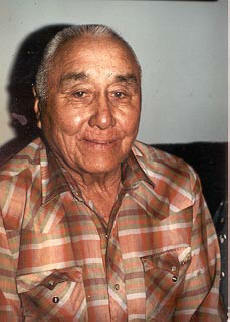 Thomas Yellowtail was born just south of Lodge Grass on the Crow Reservation of Montana on the 7th of March in 1903. His Indian name was Medicine Rock Chief, given to Tom from Medicine Crow, the famous warrior and chief born around 1848. Tom, as he was often referred to, had also received the name Dashbiilaa, Fire Heart. It was this name that you would hear, spoken in Apsaalooke, calling him to the center pole of the Sun Dance lodge to "doctor" someone. Tom's father's name was Yellowtail, of the Big Lodge clan, born around 1855. The name "Yellowtail," is in probable reference to the Ferruginous "yellowtail" Hawk. 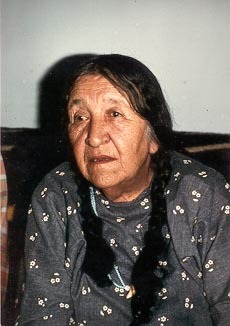 Tom's mother was Lizzie Chienne, of the Whistling Water clan, born in 1864. Tom's father passed on in 1927 and his mother, "living over a hundred years," passed on in 1969. In 1929, Tom married Susie Walking Bear and there began a close and "wonderful partnership." In 1970 at the All American Indian Days held in Sheridan, Wyoming, Tom and Susie were together honored as the Outstanding American Indian of the Year. On Christmas Day 1981 Susie passed on. Almost twelve years later, on the 24th of November 1993, Tom Yellowtail passed on "to the other side camp." Tom was a deeply spiritual man, an akbaalia, "one who doctors." I was first introduced to Tom at a Sun Dance he was "running" near Pryor, Montana. It was his responsibility to coordinate the entire three-day ceremony of "fasting," prayer and "doctoring" for the over one hundred men and women participants. Tom had "danced" in over fifty Sun Dances. In 1984, Tom "retired" as an active "Sun Dance medicine man," passing many of his "medicines" onto John Pretty on Top. Nevertheless, as an akbaalia, Tom continued to provide "doctoring" to all those who where in need of his help. In fact, he was very active up to the end of his ninety-year life, conducting "bundle openings" and "prayer meetings." During the July 1993 Sun Dance sponsored by Alvin Howe and Rob Moran, Tom was at the center pole "doctoring." That fall, Tom travelled to Illinois, to Colorado, and to Indiana, offering prayers and "doctoring." Tom had been selected as a representative to the Parliament of the World's Religions held in Chicago, and there stood along side and offered prayers for world peace with the Dalai Lama of Tibet and other spiritual leaders. In November, Tom again answered the call, and was on the Warm Springs Reservation, Oregon, "helping those in trouble." In addition to the "Sun Dance Religion," Tom was also an active member of the Lodge Grass First Crow Indian Baptist Church. For Tom, "like the separate spokes of a wagon wheel," all religions are connected and lead to the same "hub," the Creator. "They are just different ways of praying." The care shown those in need was also shown in one of Tom's great passions, his garden. As soon as I arrived at his cabin for a visit in June of 1993, the first thing Tom wanted to show me was his garden. We walked out to the eighth-of-an-acre plot and then down each row, as Tom identified for me and inspected each and every plant budding through the soil. Each was as a child, to be nurtured and cared for. Almost every year since 1929, when he acquired this land, Tom had "put in his garden." In the past, Tom would always be assisted by his wife, Susie. Beats, potatoes, carrots, corn, and radishes "as big as an apple" were among the crops shared with his family and friends come each fall harvest. As with a majority of Crows, Tom was as fluent in Apsaalooke as he was in English. While I myself had begun to learn Apsaalooke, though far from fluent, the stories Tom had shared with me and the wonderful conversations we had were all in English. Though in English, Tom's speech patterns, nevertheless, retained the same deliberate, repetitive and comprehensive qualities as his Apsaalooke. Having acquired a reputation for "extremely long, though beautifully spoken prayers," there were some who are leery of taking a sweat bath with him. "He'd pour a hot, long sweat!" And Tom would say, "I try to include everyone in my prayers." There is a word in Apsaalooke that for me has best come to express who Tom Yellowtail was. That word is diakaashe, literally meaning, "he/she is really doing it," and generally translated by the Crow as "sincerity." I know of no other human being who better exemplified this most cherished Crow quality. Tom had a reputation for having "never gotten angry at another person or of even speaking badly of them," for his "honesty," for his "compassionate, kind and gentle ways," and for always assisting those in need, "always helping others." In one small way, these qualities were publicly acknowledged in January of 1993 when Tom was honored for his contribution to the peoples of Montana as the recipient of the Governor's Award for Traditional Arts. Tom's "sincerity" is expressed in the care to which he had shared his stories, faithful and honest to their traditions and to his "medicine fathers." Four of Toms most loved stories are included in Stories That Make The World. At the conclusion of his telling of the four "little short stories," as he called them, Tom said, "If all these great stories were told..., great stories will come!" I had known Tom Yellowtail since 1974, when I began working with the Crows on a series of applied ethnographic projects. Soon after I was calling him, "Grandpa." He and Susie had "taken me in" as a "grandson," and during a "bundle opening," Tom bestowed on me the Indian name, Maakuuxshiichiilish, Seeking to Help Others. Dashbiilaa has been my guide on each of the occasions I have "gone in and used the whistle" as a participant in the Sun Dance. "Grandpa" has been my most important teacher. The wonderful example and teachings Tom and his Susie have brought forth have continued with their children, grandchildren and great-grandchildren, and so many others, touching and enriching the lives of countless people everywhere as well as each new generation, with their stories, their demeanor, their teachings, and their very spirit. Upon re-telling the last of a series of his most cherished stories from the Buffalo Days (which appear in Stories That Make World; see below), Grandpa turned to me and shared the following words that have resonated with me ever since. "If all these great stories were told, great stories will come!" The World of the Crow Indians: As Driftwood Lodges. (University of Oklahoma Press 1987 and paper 1993). Tom and Susie Yellowtail were among the primary consultants and my mentors for this book. Stories That Make the World: Oral Literature of the Indian Peoples of the Inland Northwest as Told by Lawrence Aripa, Tom Yellowtail and other Elders. (University of Oklahoma Press 1995 and paper 1999). Set in a poetic and verbatim style to better emphasis the oral nuance, this collection of narratives includes many of Tom Yellowtail's favorite stories. Yellowtail, Crow Medicine Man and Sun Dance Chief: An Autobiography as told to Michael Oren Fitzgerald. (University of Oklahoma Press 1994). A wonderful and insightful introduction to the teachings and philosophy of this great spiritual leader.